Hello and Welcome to Day 1 (of 3) previews for the February release for Sparkle Creations Rubber Stamps! Sparkle is releasing 2 new SCRS images and 1 new Karber clear set this Saturday! 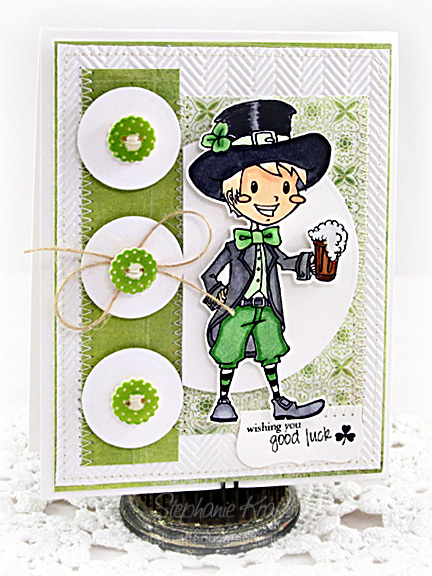 Today we are previewing a new SCRS image, Leprechaun Oliver and sentiment, "wishing you good luck"! I stamped, colored and fussy cut Oliver and popped him on top of my layout. 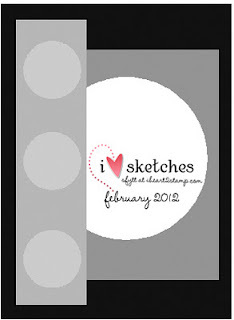 I used the February Sketch For You To Try for my layout. Be sure to visit all rest of the SCRS designers for more peeks of Leprechaun Oliver. Sparkle will be giving away a Leprechaun Oliver to one lucky person! For a chance to win, you need to comment on all of the designer's blogs (list below). Then head on over to the and comment on the Oliver post. You have until midnight EST each day to comment. The lucky winner will be announced the following day! I'll be back tomorrow with a preview of the new Karber clear set. Thanks so much for stopping by! Accessories: Standard Circle and Labels One Nestabilities (Spellbinders), Embossing folder (Provo Craft), Markers (Copic), Buttons (Making Memories), Twine (May Arts), Foam tape, Thread, Sewing machine. Awesome card, Steph! You did a wonderful job showcasing this cute Leprechaun Oliver! SUPER SUPER cute! I LOVE that embossed paper and I LOVE your trio of circles/buttons! LOVE your coloring too!!! he is so handsome with the colors you chose! lovely card! Wow! Oliver really pops on this card! Great way to accentuate the image! Leprechaun Oliver is so cute. He is my favorite. I just love this little guy and your coloring looks terrific! Super cute! Super Cute!!! Love this new Oliver! Amazing card! This card is so lovely. I love the light background and the contrast with the dark hat and Olivers clothes. And the textures and the sticthing. Awesome card! Lephrechaun Oliver is looking mighty fine, Stephanie! Love your take on the February SFYTT - thanks for playing! What a fun St. Pat's card. Those buttons are so cute.